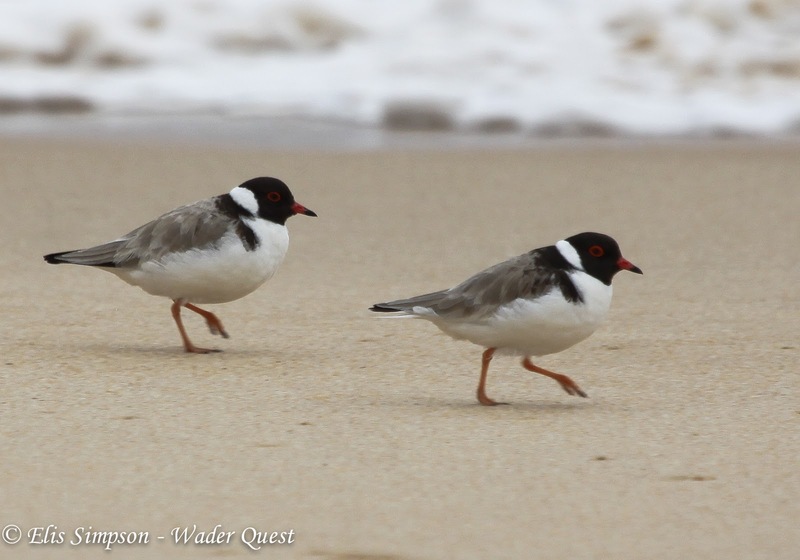 Wader Quest: A Hoodie day on the Mornington Peninsula, with BirdLife Australia. 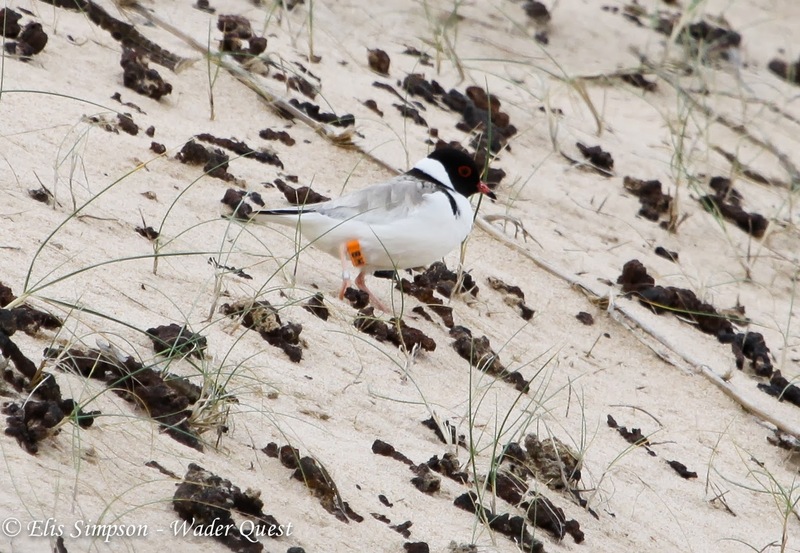 A Hoodie day on the Mornington Peninsula, with BirdLife Australia. Our last day in Australia was to be one of the most interesting in some respects. We had been in contact with the BirdLife Australia team in Melbourne, specifically Grainne Maguire, when we had tried to raise a little money at the BBF in support of the Hooded Plover project to help their ailing funds, since they had lost their government funding. Sadly for us Grainne was not going to be around during the day that we were able to visit so she asked Renee Mead the beach nesting birds project officer to stand in for her. We met Renee early at our hotel and she drove us to the peninsula, regaling us with many stories and telling us a multitude of facts and figures about the Hooded Plovers and their problems. We were to accompany Renee while she did a status check of the birds on a particular beach where there were sadly no volunteers to do the work. On arrival we headed north-west along the beach. Soon Renee’s trained eye spotted a Hoodie in the distance. As we got closer we tried to identify the bird from its leg flag, and eventually, with the help of Elis’ photos, we had BS identified. No other birds were seen in that direction along the beach so we returned and found BS now with an un-flagged bird. We then covered the beach along the stretch to the south-east of where we started in this 2km long stretch of sand. About half way along we saw a bird near the water’s edge, this bird was un-flagged. As we walked towards this bird a couple passed us on the beach, running. They approached the bird arriving well before we did, and we noted that the bird seemed to be ‘leading’ the couple along the beach as though trying to remove them from the vicinity of a nest. 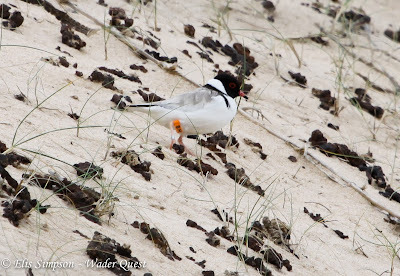 Renee remembered that there had been a nest in the dunes at this point last year and looked at the spot where this had been just in time to see a bird vacating the area, which Elis got a photograph of showing it to have the flag BH. 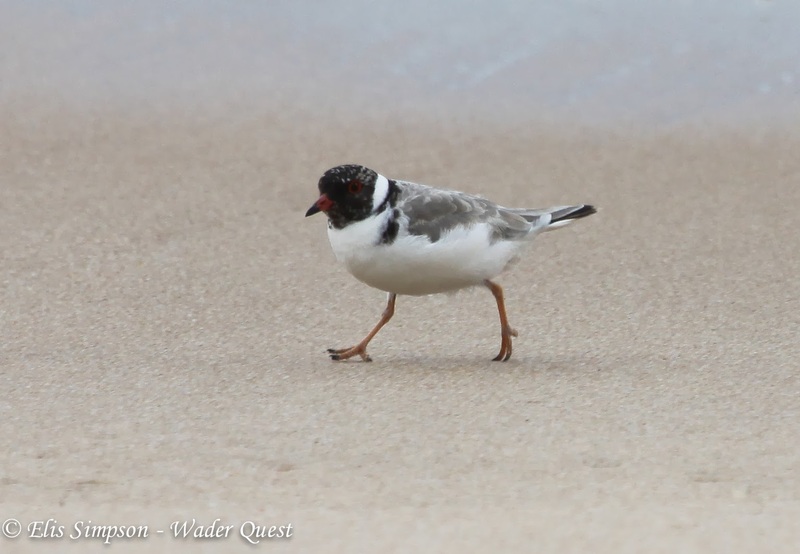 Hooded Plover BH leaving its nest. Renee then made the decision to check the nest, so we backed off and waited for one of the birds to return revealing its whereabouts. It was neither hot, nor cold, there was little wind so close to the dunes and it was not raining, so Renee judged that a nest inspection would not risk the clutch. I remained on the beach not wishing to overload the situation and Renee and Elis went to look at the nest. It contained 3 eggs. Elis took a couple of record shots and the ladies left the scene covering their footprints in the sand as they did so. The parent bird was seen to return to the nest immediately. 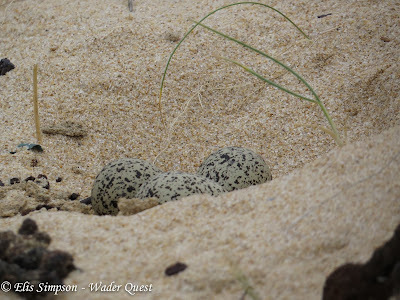 Hooded Plover nest and eggs. At the end of the beach we came across a group of nine birds together. On checking we saw that of the four birds that were flagged, three adults; one was BS, the others being JK and MU. 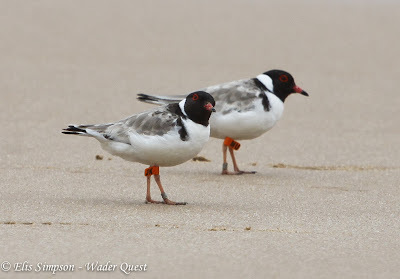 Hooded Plovers JK and MU. The remaining banded bird was one that appeared to be a juvenile being a very pale individual whose flag read D or BT, we couldn’t quite decide. 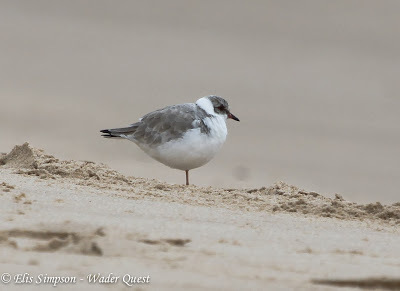 It would be a little strange to have a juvenile bird at this time of year, and looking at one of the unmarked birds that seemed to be in its first full non breeding plumage (see below), it was clear this was no young bird but a bird with aberrant plumage. 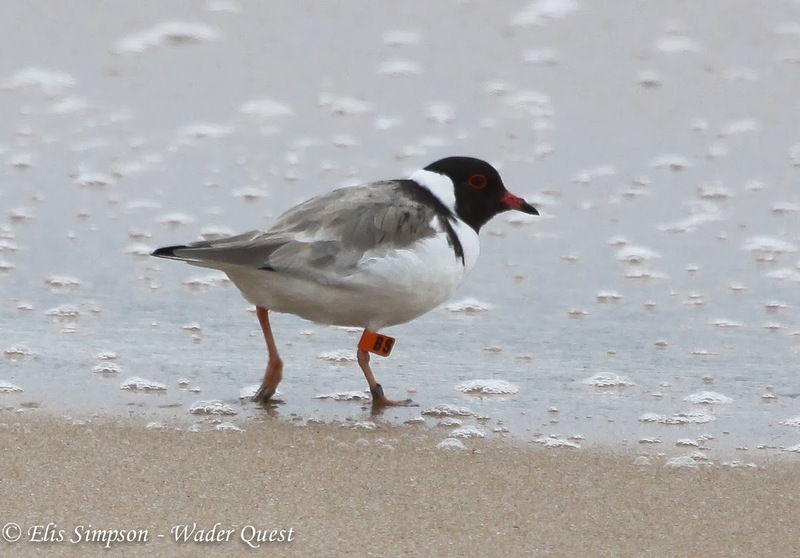 Unflagged 1st breeding Hooded Plover. Having checked out these birds we returned to the car. On two occasions Renee had to speak to beachgoers flouting the rules of the beach, one a couple walking a dog in an area where they are prohibited and the other a group consisting of two ladies with their assorted children. These children were being encouraged to sand toboggan down the dunes. 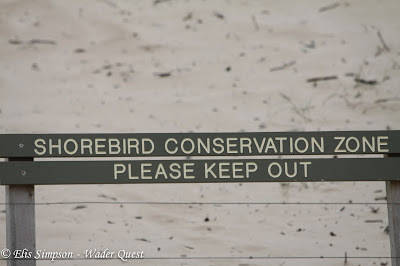 As if this wasn’t bad enough they had to duck under a sign saying Shorebird Conservation Zone Please Keep Out! The response of the ladies to Renee trying to explain why these rules are in place was not at all understanding, they could clearly see no reason why the rules should apply to them. 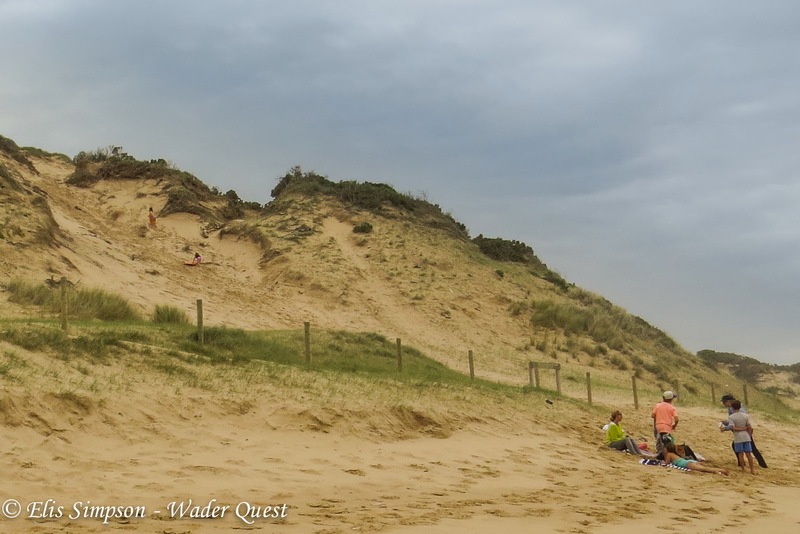 Kids on dune top left, responsible adults right, next to sign, (detail below). 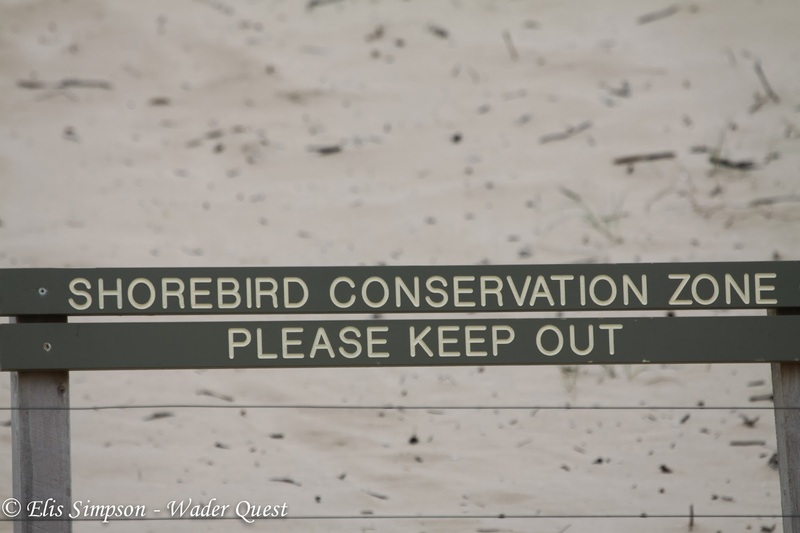 The sign under which the kids had to pass to access the dunes passing a wire fence to do so. We returned to Melbourne with Renee who took us to finally meet Grainne at the BirdLife office. 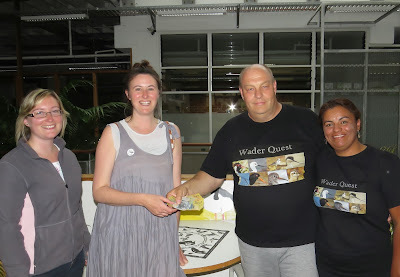 There we were finally able to hand over the 350AUD cash we had raised for the project. In the greater scheme of things it may not have been an earth shattering amount, but we were proud to have been able to make a contribution thanks to the generosity of Wader Quest supporters (190AUD BBF collection, 63AUD South African talk collection, we added 57AUD to make it a round 300AUD and 50AUD Ms J Giles West End QL, received in Broome). It was such a pleasure to hand over the money in person. (L to R) Renee Mead, Grainne Maguire, Rick and Elis Simpson. The Hoodies are in serious need of help, and we will be looking to see how we can help in the future. Our thanks go to Renee Mead for her knowledgeable company in the field on the day and to Grainne Maguire for inviting us.